When facing the church, the entrance to the playspace is the ground-level door between the two stairs. 1. Take the Lowell Connector to Exit 5B (Thorndike St./Rte. 3A North). 2. 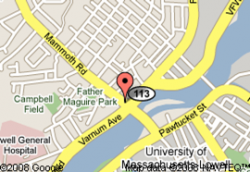 Turn left at the 4th light onto Fletcher St. Go to the end of the street; turn left onto Pawtucket St.
3. Turn right at the next light onto Mammoth Rd. 4. Go over the bridge; the church is on the right. The parking lot is just beyond the church; if the lot is full, please use street parking.